Chasing Davies: The Bachelor Recap: Lots O' Crazy - I Mean, Fashion! The Bachelor Recap: Lots O' Crazy - I Mean, Fashion! Updated on 1/11 @ 7:11pm CST - scroll down! Monday's episode (the 2nd one, airing Jan 2nd) was filled with annoying drama! The fashion was ALMOST masked by all of it, but thankfully I have my priorities straight... Let me know if you're looking for anything! 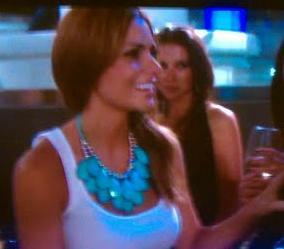 Lisa M. rocked a pretty green off the shoulder dress, by BCBG a couple summers ago on the 2nd episode of The Bachelor. 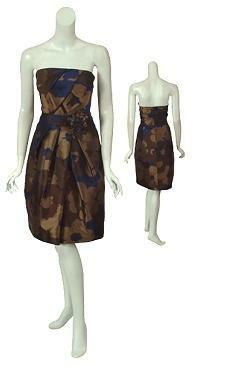 You can find that dress on Ebay in size L (and another on Ebay in size M). 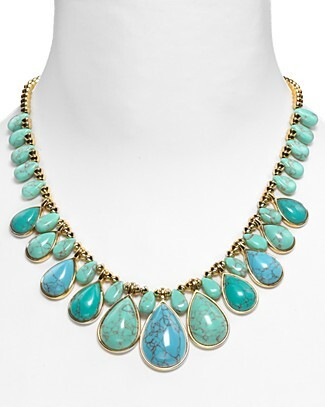 You can find similar necklace options here. It was Michelle's bday in the 2nd episode - did you know that? 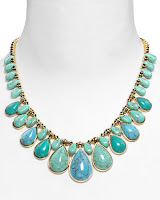 You may not have caught the few hundred times she mentioned it... but she did have a great teardrop turquoise necklace that was from Max&Chloe last summer. 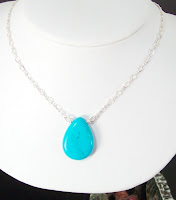 Single beaded version of hers: Blue Turquoise Teardrop Necklace via Etsy; Smaller Version of hers: Sky Blue Teardrop Necklace via Etsy; Ralph Lauren Teardrop Turquoise Necklace via Bloomies; Most similar to Michelle's: Teardrop Turquoise necklace via Ebay. As Pamela mentioned, this necklace also looks a lot like Anthroplogie's Stormy Seas Necklace from awhile ago. A silly bandz! Hah! What?? From Vampire to Kid Flare? Everyone is asking about Emily's green & brown floral print dress she wore on the 2nd episode of The Bachelor. So far I haven't found it - but will keep looking! 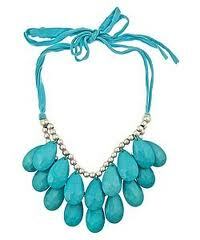 In the meantime, I'm also compiling some similar options for you all trying to get your hands on the look! I'll keep looking for more options! Any fashion requests - something you saw and loved? I can try to help locate it or find a look-a-like. As I mentioned before, this was filmed Sept-Oct, so some of these pieces were probably purchased late Summer or already owned and may not be available any longer.